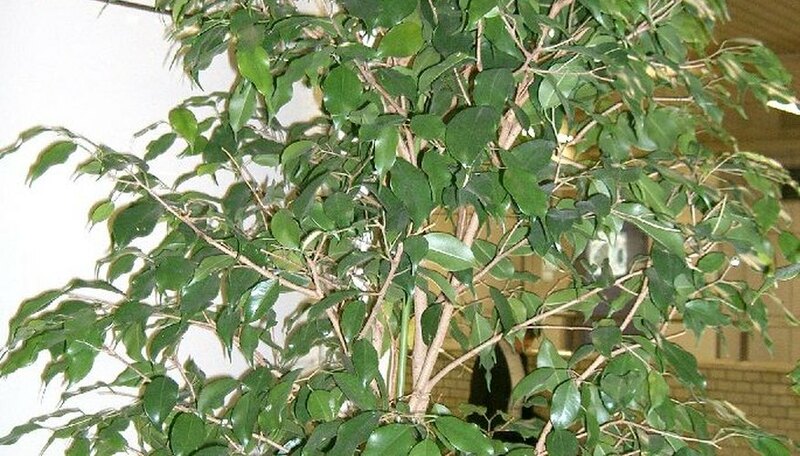 Ficus are popular container plants that grow well in outside conditions in the warmest regions of the U.S. A gardener should be aware of three main things when caring for a ficus tree: Help a container-grown tree adapt to its new environment, water the tree properly, and keep the tree insect free. Once you understand the ficus tree’s growing requirements, caring for it will be relatively easy. Situate your container-grown ficus tree in a location where you will not have to move it often. They do not like changing environments. Once a ficus becomes used to the conditions in a particular area, moving it can cause the leaves to turn yellow and die. It will rebound but may look ugly until it grows new leaves. Place or plant your ficus in an area that receives a high amount of light. If planting the ficus outdoors, place it in an area that receives full sunlight. Indoors, place the ficus in an area that receives bright light, such as a window located on the southern portion of your house. Green ficus can tolerate lower light conditions than the variegated types. Water your ficus regularly, keeping the soil moist at all times. Container-grown plants should be watered approximately 1 to 2 times per week. Feel the soil, and water when it begins to feel like it is drying out. Ficus planted outdoors will need weekly watering for the first couple of weeks; then cut back to once every couple of weeks. Plant your ficus in a container that drains. Start off with a container twice the size of the root ball. Use a rich potting mix. Ficus trees actually prefer to live in containers where they will become pot bound. Outside, plant your ficus in an area where it won’t interfere with structures or septic systems. Prune your ficus whether outside or in the container to contain its size or to shape it up. Ficus trees require no pruning unless their intention is to be a hedge, or their size begins to get out of control. Prune back only one-third of each limb. Fertilize your ficus only if you desire it to grow more rapidly. Ficus trees really do not require any fertilization unless they are planted in strictly sandy soil where no organic matter is found. Place a bag of manure on top of the existing soil. Container-grown ficus do not require fertilization because it will only make them grow faster and bigger. Treat your plant with an insecticide that is specific to it. Mealy bugs and scale are the ficus tree’s main problem and can be controlled by spraying the tree with an insecticide designed to kill them.